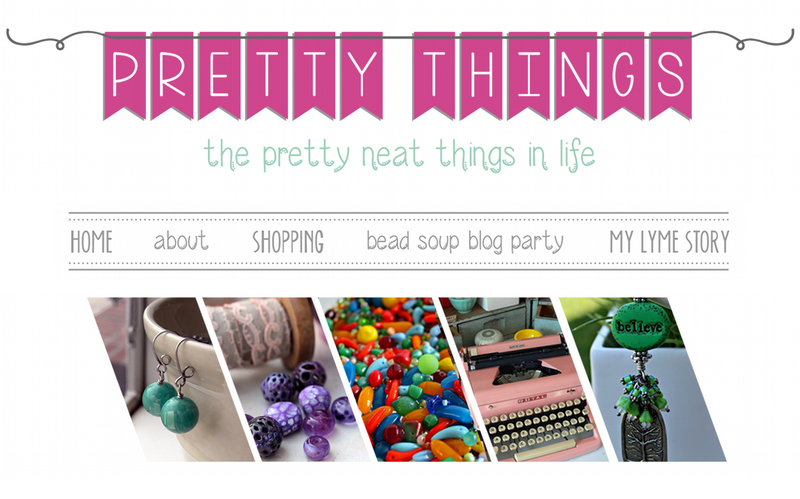 Pretty Things: The 5th Bead Soup Party Participants! OK, guys, here you go! And if you missed my post yesterday, and didn't get chosen by the randomizer, please click here. First, I will be emailing each person so if you do NOT get an email from me TODAY, I'm getting caught in your spam or have a bad email. Be sure to mark me as a safe sender and email me right away! I'll also be explaining in my email what to do next. Once you get your emails from me, please contact each other as I have certain things you'll need to ask each other to make sure this all goes smoothly. 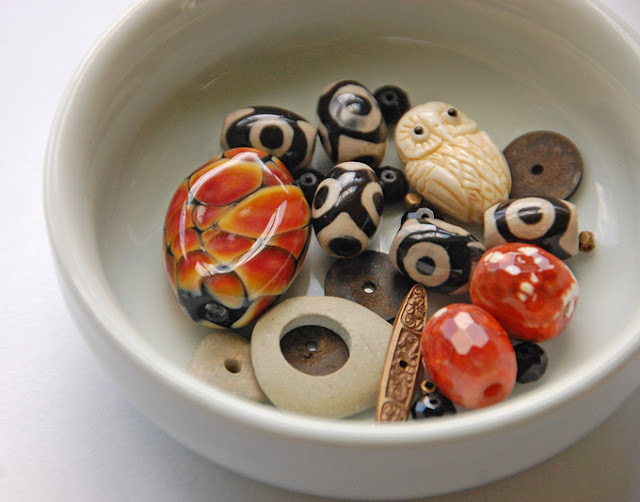 A good sample for bead soup -- photo by Cindy Wimmer. NOW! I've never done one of these parties without screwing something up. SO! If you are listed twice, end up having to ship internationally when you didn't sign up for it, or have the same partner as you've had in the past, click here to email me. Additionally, if you have ANY concerns, please contact me privately by email. (Check both sides of the list, as I've listed everyone as pairs). And if your link is incorrect, please let me know. Ha! - I must admit I am a tad excited. I really didn't think my name would be drawn! Looking forward to participating, sharing and making more new friends! Stay cool Lori, all is going to just fine! Congrats everyone! I am looking forward to see what you are going to create! And wow! From all over the world, that's wonderful. Looking forward to seeing what everbody creates with all their ingredients. Congratulations! Looking forward to seeing what everyone creates. So glad to see that my name was drawn! As always, thank you for hosting this, Lori! Wow! I am excited about having been chosen. This is going to be fun! Wow!! I am so excited!!! I feel so lucky!! SO excited! :-) I think this is a first...I NEVER win anything for which there is a draw! I'll be taking Lori's 'non-souper' challenge for sure! Holy heart failure, Batman! I'm Jazzed! Yaaa..I'm so excited to be a part of this creative adventure! It will be fun to see how everyone including myself stretch themselves!!! Looking forward to seeing everyone's creative work! Congrats to all who got selected! I can't wait to hop around and see all the wonderful designs everyone creates! I am so excited! I never get picked for anything! A million and one thank yous to Lori for putting this together!! I think seeing my name just made my day!! Looking forward to working with my partner and then the best part of visiting blogs!! How exciting! Am secretly a bit relieved I didn't get picked as I am such a beginner myself! I am really looking forward to seeing everyone's creations! Thank you Lori! And will have a great artist partner! So much looking forward of this exchange. Thank you Lori for hosting this big blog party! Congrats everyone!! And I'm really going to try to the the alternative project that Lori mentioned. It just might get me beading again!! Oh what a happy day it is! 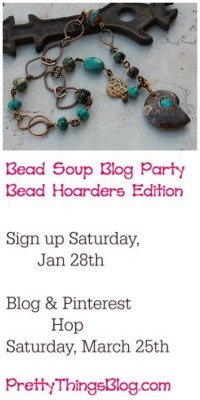 Im so excited to meet my bead soup blog partner. Sorry I won't be in this Bead Soup but I'll be signing up for the next one. And I'm looking forward to seeing what everyone gets and does. Have fun, y'all! Wow - this has certainly gone international!!! I am so excited to have been picked - and I am so excited for you, too! You should be so proud of all of your accomplishments to have such a turnout! I cannot even begin to imagine the administrative nightmare you have to go through, but I truly am grateful! I can't wait to meet my partner and new blog friend! Thank you so much for hosting this, Lori! I am so very excited!! My partner and I are #62. Krafty Max and Sandra Miller. I just sent her an email and am already look around her sites to see what I can send her!! This is going to be so fun! Congratulations! I'm looking forward to all of the lovely designs!! Whee! I got picked!!! I never get picked for anything. So this is great! Thanks Lori, and your fabulous radomnizer :-). Perhaps a little mix-up though? I think it's Hajer who's from Bahrain; I'm in Singapore. Congrats to all those who were selected. 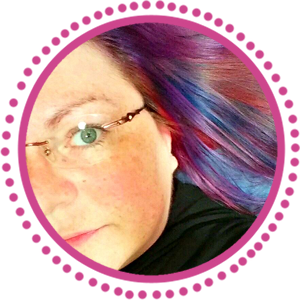 To those who weren't so lucky, I hope you get a chance to play at Lori's next blog hop. Congrats to everyone that made it. I look forward to hopping to all the sites to check out the wonderful creations. I always get an aha moment when I do this - I never would have thought of that. I too will be going the alternative route and will be posting a piece from my own bead soup. Yay, I got it! 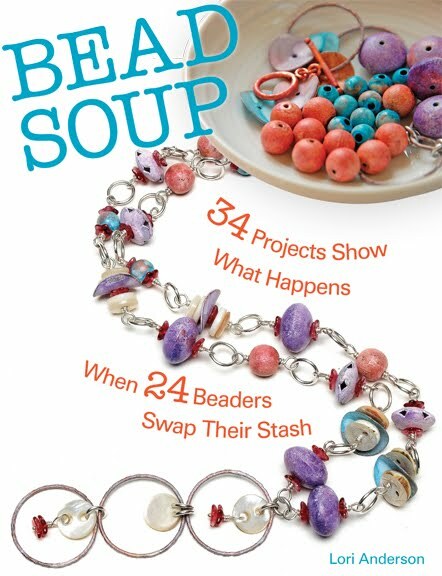 This will be my first time with Bead Soup and I couldn't be more thrilled! I'm looking forward to meeting my partner and learning more about her. Thanks Lori for hosting the party. Congratulations to the participants...I will be looking forward to seeing 200 beautiful creations! OMG, I discovered my name in the list! And I got THE mail from Lori, so I'm really in! Now I'm getting nervous.. Happy Creating everyone!! I'm looking forward to seeing what everyone cooks up this time around. Have fun! It really is interesting seeing what countries the participants are from. What a truly global community! Looks like a great list Lori! Well done. I will enjoy seeing what everyone comes up with. Exciting mix of designers Lori! I look forward to stopping by and seeing what everyone creates! I am excited to be following this party. Looking forward to what you all come up with. Congratulations! Guess I missed out, couldn't find my name on the list. Congratulations to the participants, I have had a lot of fun with this in the past. I'm a little sad to stand outside , but, have fun!